The food tech category encompasses everything from Grubhub-Seamless competitors to laboratories designing plant-based meat. The bulk of funding has gone to food delivery startups, which raised nearly $5.5 billion last year and include two of the most well-funded food startups, China’s Ele.me and Germany-based Delivery Hero. However, startups are also tackling such unique categories as subscription services for international snacks, and neighborhood meal-sharing. 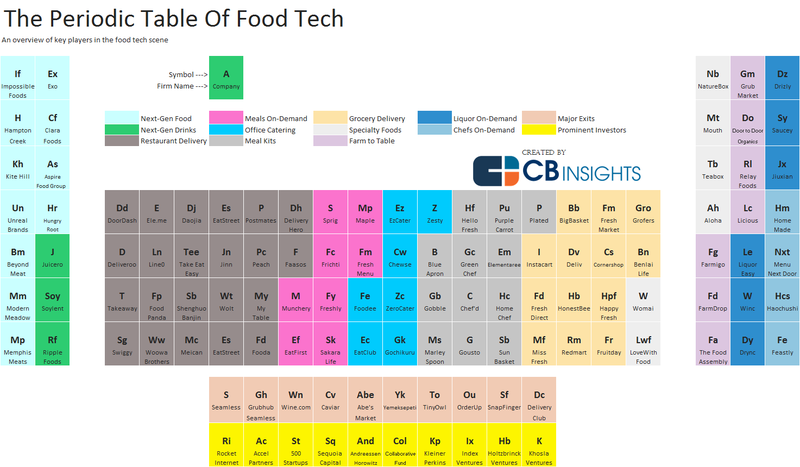 To illustrate the diversity of categories within food tech and call attention to some of its most prominent players, we created the Periodic Table of Food Tech. The table focuses on active food tech startups that have raised funding since 1/1/2013. While it can’t encapsulate every startup in the space, it highlights many of the most well-funded and high-momentum companies within each category. The table also shows most notable food tech exits and most active food tech investors. Download the free report to learn about the emerging trends taking over the food and beverage industry and strategies to watch for 2019. The top part of the table lists private investor-backed companies in select industries. The bottom two rows display notable exits and most active food tech investors. Next-Gen Food – Startups engineering new types of food products, with a focus on health and environmental sustainability. The most common focus here is creating plant-based proteins, a problem tackled by startups like Impossible Foods, Hampton Creek, and Beyond Meat. We also note several startups trying to make insect protein more palatable, such as Exo and Aspire. There’s one — Unreal Brands — that’s designing a healthier candy. Next-Gen Drinks – Startups engineering new types of beverages. On our table, Ripple focuses on plant-based milk, Soylent created a new type of liquid meal, and Juicero offers a smart juicer with farm-to-table juicing packs. Restaurant Delivery – Startups offering middleman delivery services for restaurant meals. Generally, users can order meals from nearby restaurants on their phones and have them delivered right away. This category includes some of the most well-funded food tech startups, like China’s Ele.me ($2.3B in disclosed funding), Germany’s Delivery Hero ($1.3B), the UK’s Deliveroo ($200M), and DoorDash in the US ($187M). Meals On-Demand – Startups that deliver pre-cooked meals to users. While the end result may be similar, these startups have a different business model than restaurant delivery startups, since they also manage the meal preparation themselves from a central kitchen and generally provide just a few meal options per day. Examples include Munchery ($117M in disclosed funding) and Sprig ($57M in funding), both based in California. Office Catering – Online-based catering platforms for offices. For example Zesty, with $20M in disclosed funding, works with restaurants to arrange meal plans for San Francisco-based companies. Meal Kits – Startups that send recipes and pre-packaged ingredients to help users cook at home. The category includes well-funded startups like Germany’s HelloFresh ($278M in total disclosed funding) and Blue Apron ($193M). Some companies in this category focus on specific niches, such as The Purple Carrot ($10M) which is vegan. Grocery Delivery – Online-based delivery services for groceries, such as Instacart, with $275M in disclosed funding, and India’s BigBasket, with $246M. Specialty Foods – Online platforms to order pre-packaged, non-perishable foods. Beijing-based Womai, which sells directly imported foreign food items to Chinese consumers, has raised $320M. Farm-to-Table – Startups that cut out the middleman and deliver food directly from farmers to consumers. They generally promote healthy or organic eating. Companies include Farmigo ($26M), FarmDrop, and The Food Assembly (known as La Ruche Qui Dit Oui in its home country, France). Liquor On-Demand – Apps and websites for alcohol delivery, like on-demand deliverer Drizly ($18M in disclosed funding), or Winc, ($42M) which provides direct-to-consumer wines from wineries with a membership model. Chefs On-Demand – A small category which has already seen multiple startup failures, these startups connect consumers directly to chefs. Homemade ($2M in disclosed funding) and Feastly ($1M) let chefs cook meals at home for users. Menu Next Door lets neighbors buy and sell meals. Want more data on food tech financing trends? Login to CB Insights or sign up for free below. Food Tech also has a massive transformative segment called Restaurant Tech. These B2B + B2C cloud solutions help restaurant operators better manage their cloud stack (http://happytables.com) originate takeout sales (http://zuppler.com) take reservations (http://bookatable.com and http://opentable.com) manage purchasing and supplies (http://orderly.com) and create new channels to find customers and generate sales (http://foodiebot.com).